Pocket change, the worst enemy of my pockets. It’s heavy and just sits in a jar at my home all day long while it gets bigger and bigger. Ever had one of those times where you wanted to just get rid of your pocket change, but tired of packing your own coin rolls or going to a local supermarket to use one of those change sorting machines where you pay ten cents for every dollar? Well, here’s the easiest way to dump your change with no surcharge, it’s for paying your public transportation. No, I’m not encouraging you to dump tons of nickels into a bus farebox, that just holds up the bus and you get that awkward stare from fellow passengers. Just feed it to your Clipper card's e-cash purse. There’s one easy way to do this, just go to any BART station’s ticketing machine. The nice part about BART ticketing machines and Clipper is you can put as little as five cents onto the card and up to 30 coins per transaction. Once you put in 30 coins, the machine locks out additional coins, and you just confirm the value and tag the card to update the balance for instant use. If you have more coins, just do the transaction again. Some of you may be asking, can I do this at a Muni metro or Golden Gate Ferry ticketing machine? You can, but the software will first ask you what specific amount you wish to input into the machine before you are allowed to feed coins. Always select the lowest amount because the machine will lock you out at the 30th coin, but you can still feed bills into the machine to fill in the gap. Be warned, the machine will only give a maximum of $4.95 in change if you overpay, so have dollar bills handy, and not a $20. There is one big weakness for both of these options: They won’t take pennies. 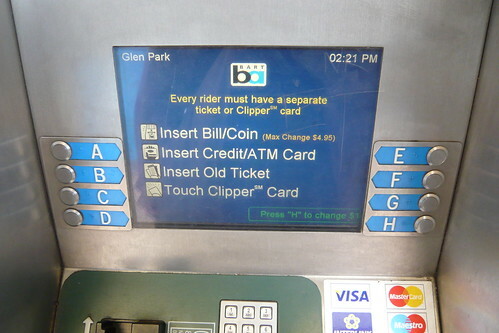 Why not add more e-cash to your Clipper card and get rid of most of your pocket change?